Recently I came to a fork in the road of vulnerability. A staggering amount of time had gone in to writing and re-writing my last post. Much more than usual. I waffled between chalking what had spilled out onto the page up to the past, clicking delete to keep it there forever and pressing publish, bringing it in to the light. In one quick impulse click I chose the latter. A sense of completion generally comes with releasing words out into the world but this time I was second guessing my decision and an undercurrent of anxiety set in. Fast. Things are so different now. Why share all that? The whole thing was so heavy. People are going to think I'm bipolar. Maybe I am? Sometimes in order to explain where you're going, you first have to explain where you've been. That was the lemons post: compulsory in nature and by no means graceful. But if I don't share the sorrow I fear you'll miss the depth of the joy and that would undermine this whole thing because it is ultimately about joy. In a dark season of depression I learned, among many other things, that solidarity begets healing and that the only way to create that solidarity is through vulnerability. Because we're about to bound off in a different direction I wanted to acknowledge it, building a bridge of sorts between what was then and what is next. Otherwise you might reasonably conclude that I am, in fact, bipolar. Despite the wide swing in sentiments I can assure you that I'm not. An online screening tool confirmed that I am simply a normal human being. So what exactly am I spilling my guts in preparation for? Well, about a half a dozen things that are by no means straightforward but for awhile I've been kicking around this idea of soul care. For creatives. My job is obscure. A killer conversation starter. I've talked to so many about what makes them feel alive, creative, inspired, and purposeful because of it. It sometimes takes a minute for people to unearth these hidden and often suppressed parts of their identities but when they do allow themselves to dream out loud or share the something they've been planning for someday, the enthusiasm mounts and they all-out glow. They're not just describing what they want to do - they're describing what they were made to do. It's in those moments that I just want to take them by the shoulders, look them square in the face, and tell them with every ounce of urgency I can muster that they are brilliant and so is their dream and they absolutely must pursue it. That their life and the vitality and peace of their soul depend on it. I've yet to find words emphatic enough to convey the swell of emotion and what can only be described as a visceral response to it - I am indignant at wasted potential. Your dreams are not accidental, coincidental, or meaningless. There's good reason why you can't stop thinking about that one thing. Why when you're able to entertain it, pursue it, dream it, do it you bust through the mundane and get a glimpse of a different kind of existence. One where you are more fully you. It's the light inside you illuminated by the One who placed it there to begin with. To ignore it, fear it, or put it on a shelf under a basket is tragic. I get to live my one thing. I can't tell you how thankful I am every day. And I know that experience isn't reserved for me or a handful of fortunate few. I also know that it's not easy to get there. The joy of possibility lives right alongside the reality of daily life and our disparaging inner critic. The obstacles are endless. Outward challenges of logistics like time, resources, energy, and procrastination and internal obstacles of shame, fear of failure and rejection. Fear that someone will tell us our dreams are dumb or our goals are ridiculous and out of reach. An entirely unexpected entrepreneurial life in food is still unfolding for me. Over the years friends have been faithful to pick me up, brush me off, and push me forward through various flub-ups and all forms of discouragement. I'm incredibly needy and for good reason: it's tough out here. They can attest to how often I need to be told that I have value. That I'm capable, supported, and that my grand plans are not only meaningful but possible. It's often what people in those conversations need to hear and I'll bet you need to hear it too: A kind word every now and again to propel you forward, encouraging you to give light and life or even just the time of day to what's inside. Honest words about self-worth and comparison that offer a safe place of solidarity and words of truth that can go to battle with the lies that you're not enough/qualified/worthy/capable/fill in the blank. Even practical words on how to overcome all those outward obstacles of logistics. Whatever cares for you in your pursuit of what you were made to do - that's what I mean by soul care for creatives. Unrealistic for a digital platform? Maybe. But shying away would be hypocrisy to the nth degree and so here we are. Laying the groundwork. One last thing - just so we're clear, we're all creatives. God creates. God made you. You are a reflection of God. Therefore, thou art a creative. Even if your passion lies in crunching numbers or curing cancer. Still creative. Super creative actually. So if somewhere along the way here you counted yourself out because your thing doesn't fall somewhere in the realm of what we like to call, by tired definition, "the arts" then it's time to come back. Hopefully the wheels in your head are already turning over your one thing - or over your many things. I readily admit that I come from no place of authority outside of what I have lived and learned myself and while it's not everything, it's certainly something. For a long time I didn't think it was. But I was wrong. And if at any point I start to sound out of touch with how uppity positive it's bound to get in here at times, I left the lemons post up. For both of us. Preheat the oven to 350 degrees. Oil a standard* 9x5 loaf pan and line it width-wise with parchment paper so it overhangs on the sides. These little wings will make it easier to remove the loaf from the pan later. Oil the parchment and dust the inside with flour, tapping out the excess. In a medium-sized bowl whisk together the flour blend, baking powder, xanthan gum, and salt. In the bowl of a stand mixer combine the sugar and the grapefruit zest, rubbing with your fingers to combine, 30-60 seconds. Add the eggs, oil, and vanilla to the sugar and beat on medium-high speed for 4 minutes. Reduce speed to low and add the kefir followed by the flour mixture and the grapefruit juice. Beat on medium low for 20 seconds. Increase speed to medium-high and beat for another 30 seconds. Stir in 1 tablespoon poppy seeds and transfer to prepared pan (see note.) Sprinkle remaining teaspoon of poppy seeds on top and swirl gently with a knife. Bake for 45 minutes to 1 hour or until a skewer comes out clean. Cool in the pan for 10 minutes before running a knife around the edge and using the parchment wings to remove it from the pan. Cool completely on a wire rack before glazing. To make the glaze whisk together powdered sugar, kefir, and grapefruit juice. 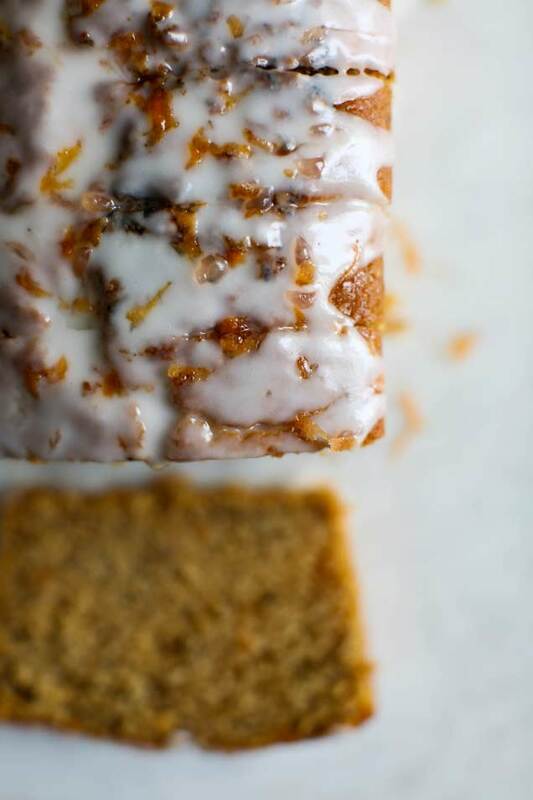 Pour over cake and garnish with citrus zest. *NOTE: Believe it or not there's not much that's "standard" about a loaf pan. Fill yours no more than 3/4 of the way full to avoid overflowing. Any extra batter can be baked in a small cake pan or a cupcake pan in papers.